Grundy Center, Iowa Apr. 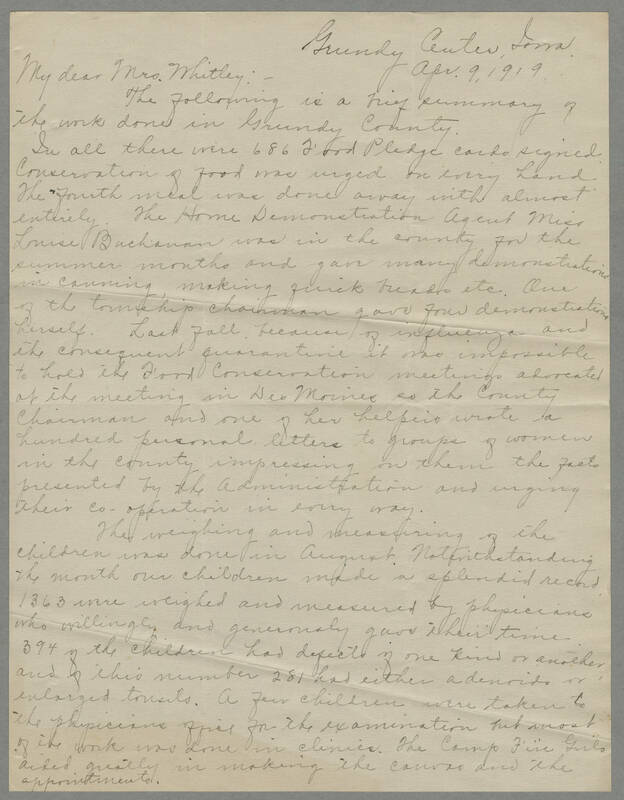 9, 1919 My dear Mrs. Whitley: - The following is a brief summary of the work done in Grundy County. In all there were 686 Food Pledge cards signed. Conservation of food was urged on every hand. The fourth meal was done away with almost entirely. The Home Demonstration Agent Miss Louise Buchanan was in the county for the summer months and gave many demonstrations in canning, making quick breads etc. One of the township chairman gave four demonstrations herself. Last fall because of the influenza and the consequent quarantine it was impossible to hold the Food Conservation meetings advocated at the meeting in Des Moines so the County Chairman and one of her helpers wrote a hundred personal letters to groups of women in the county impressing on them the facts presented by the Administration and urging their co-operation in every way. The weighing and measuring of the children was done in August. Notwithstanding the month our children made a splendid record 1363 were weighed and measured by physicians who willingly and generously gave their time. 394 of the children had defects in one kind or another and of this number 281 had either adenoids or enlarged tonsils. A few children were taken to the physicians office for the examination but most of the work was done in the clinics. The Camp Fire Girls aided greatly in making the canvas and the appointments.